I believe Coral told me she originally received a cutting of this plant from her mother. I’m sure she’ll tell me if that’s not the case, but the point is, she gave me a cutting and I was able to get it to strike, and (wow) it grew a flower. And what a flower it is with its petals shaded red through to violet and purple. The outer petals looked the colour of a (good) deep wine, the next row a brighter shade of red, but the inner row is a bright fuschia with deepening purple-red at the centre. Coral referred to this plant as a Giant Zygo and a quick search on Google reveals this plant is called Epiphyllum, and just like the Zygo (Schlumbergera), it is an epiphytic cactus that belongs to the same family (Cactaceae), and just like 80% of all cactus, it also belongs to the same subfamily (Cactoideae). But that’s where the (plant family) similarities end because they belong to different tribes and different species. Epiphyllums are actually more closely related to Dragon Fruit (Pitaya) and are native to Central America. 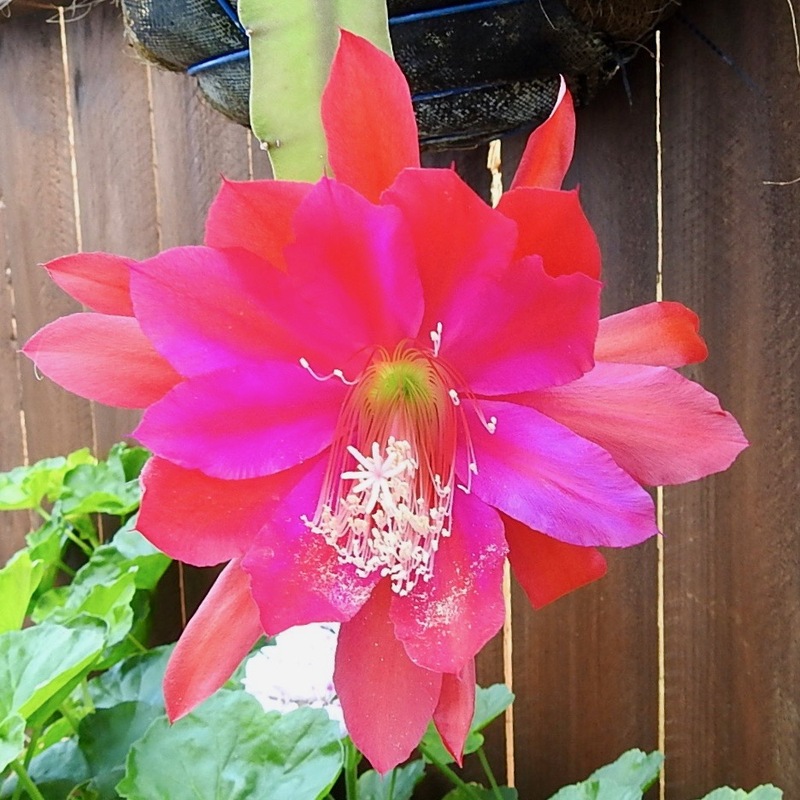 They are also known as climbing cacti or orchid cacti and make for a spectacular display in a hanging basket. As you can see, I have this beauty in a half basket attached to the fence. I believe this one is a hybrid called Conway’s Giant, and it’s easy to see why the word ‘giant’ is included in its name. It’s huge, not at all what I expected. What a tremendous bloom. Not what I expected at all. 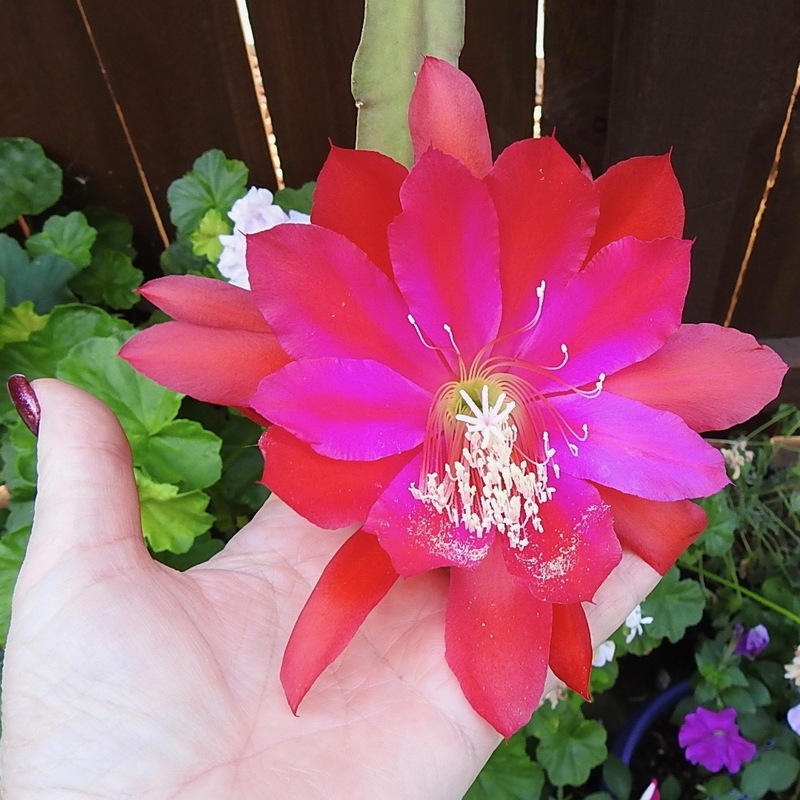 It is so impressive in size – almost bigger than my hand – and it has a lovely fragrance. I was reading that a single bloom on certain species has the ability to perfume an entire house. WOW! Like many of the ‘grow it forward’ plants in my garden, this one is named after the lovely friend who gave it to me – thank you Coral. Sadly, only two days after blooming, the flower has reached the end of its lifecycle, but I enjoyed looking at it for the 48 hours it was there, adding an impressive display to my garden. Thank you Gill. I could hardly keep my eyes off it for the two days it bloomed. What a beauty and how quickly your garden has come along since it was just dirt. I posted on your other posts as well but WP is playing games with me! Thank you Nancy. WP has been playing up for me also. Fingers crossed they fix it soon. The leaf that shows looks a bit like a Christmas Cactus in the US, a succulent that booms once or twice a year, usually at Christmas. Your bloom is much bigger though. Spectacular! Gorgeous!! All from a cutting?!?! Hello – I’d like a cutting please! !